Rodea Speed Run Contest! 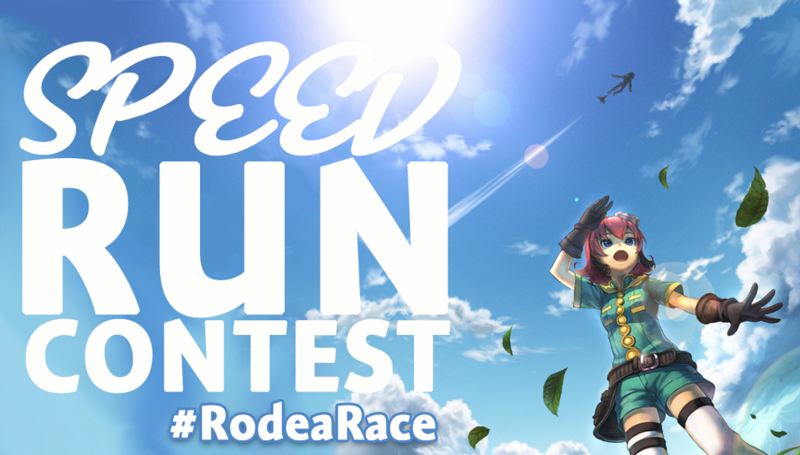 | NIS America, Inc.
Home / Blog / Rodea Speed Run Contest! This #RodeaRace is a North American contest that will put the best speed runners to the test. Who will be the ultimate flier? Who's the coolest sky soldier? Check out the rest of this post and then click here to enter the #RodeaRace! We thought it would be fun to see how fast or adventurously all you awesome doods were able to complete the first level of Rodea the Sky Soldier, and what better way than by having a contest? Make sure to tag all your comments about the contest with #RodeaRace to keep up with the conversation. We're hoping to hear and see lots of awesome stuff! The #RodeaRace ends December 31th, 2015 11:59 PM EST. Voting for the People's Choice Winner will close January 15, 2016. Winners will be announced on January 18th, 2016. Entries may be recorded and archived on Twitch, or directly uploaded to YouTube. If NIS America has sufficient proof that the speed run was not recorded on a legitimate version of Rodea the Sky Soldier, that the integrity of the video was compromised by editing, or that the user intentially exploited a bug, the entry may be disqualified. Complete contest rules may be found on our contest rules page. This is the first contest of this kind for Rodea the Sky Soldier so we hope you'll have fun! Go enter the contest right here, and be sure to check out all the competition and vote for your favorite run! If you have questions or want more information on the contest, please feel free to contact us on our Facebook page, www.facebook.com/nisamericainc.